Blogging here is a bit light at the moment. So instead of reading F&T, head over and check out the wonderful essay by Jessica DeCou of Chicago Divinity School: "'Too Dogmatic For Words'? 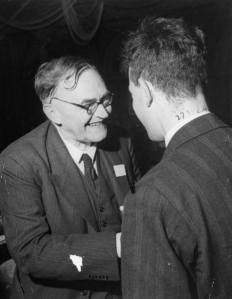 Karl Barth's Comic Theology", Religion and Culture Web Forum February 2011. She argues that Barth's legendary combativeness and his legendary humour are two sides of the same coin: a "comic" theology. I think Eberhard Jüngel once described Barth as "the happiest theologian of our age" – and this essay shows that laughter and comedy are important for understanding Barth's thought. And while you're at it, here's another interesting piece on Barth: John Parratta, "Barth and Buddhism in the Theology of Katsume Takizawa", SJT 64:2 (2011).